The Sims 3 Supernatural and The Sims 3 Seasons both provide brand new ways to play The Sims 3, with epic new features and tons of content. The two expansions, however, offer wildly different experiences; from mystical creatures in Supernatural, to the awesome and destructive power of weather in Seasons. Fans have always asked us to tie together expansion packs and the gameplay. We really wanted to do this and it's never been done before. The Weather Stone was a natural fit. It capitalizes on the best parts of each expansion by giving players control over amazing new weather from Seasons, with the awesome new Supernatural Sims from Sims 3 Supernatural. 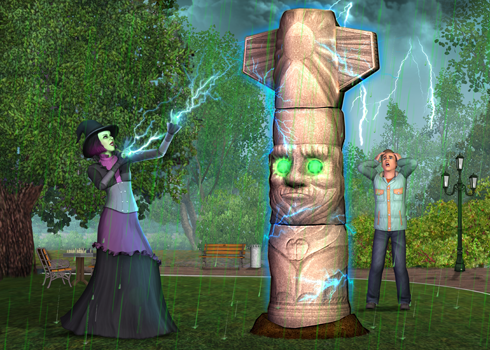 Each Supernatural Sim has their own unique power over the Weather Stone, so you'll have to use it wisely depending on what you're after. Witches can use it to summon a Bewitching Rain that causes Sims throughout your world to go crazy and perform rain dances. Vampires can call forth an Eclipsing Fog that mysteriously makes normal Sims more open to being fed upon by vampires! Fairies on the other hand, can bring on a Reviving Sprinkle that revives dead plants, kills weeds, and drapes the town in a beautiful rainbow. Finally, Werewolves can beckon the powerful Hunter's Storm which brings on a snowdrift full of collectibles that Werewolves normally hunt for. Depending on how you play, and who you play as, the Weather Stone packs a powerful punch to help you out in your aspirations.